Aretired prison official said recently that our criminal justice system seems to be dealing with two categories of people: those who live above the law and those who are absolutely crushed by it. His statement makes sense. If we view it rationally, prisoners are one of the weakest constituencies in our society. They have no voting rights, have very limited access to the outside world and are under the complete control of the prison authorities. They cannot speak with the press, write letters or speak with their families without the permission or censorship by the prison officials. The majority of these voiceless people remain in prison pending trial or conviction. They continue to be held in overcrowded prisons for years while the occupancy in prisons have exceeded by over twice above its sanctioned capacity. Often, they have no own lawyers, live in pathetic conditions, do not have access to adequate medical care and are likely to be tortured or exploited. The system fails the prisoners at every turn and the agencies blame each other for non-performance and unaccountability. Advancement globally, it is now an accepted fact that rehabilitation of inmates will be meaningful only if they are employed after release and for that purpose educational and vocational facilities should be introduced or upgraded. To accomplish this objective, few simple steps could be initiated without much expense. For example; various courses could be offered leading up to University level education. We can also impart courses in vocational training including computer technology. We can provide professional training in carpentry and fabric painting and also initiate programs for women empowerment by training then in weaving, making toys, stitching and making embroidery items. Wage earning and gratuity schemes and incentives can be used to reduce the psychological burden on the convicts. Such practices will help in changing the traditional and colonial outlook our Prison system and also help the prisoners to become more responsible, creative and potential citizens. Rights Advocates of inmates' rights are of the opinion that inmates are always deprived of basic human rights. This is due to the inherent policies in the system, which still reflects the archaic penal philosophy. In countries whose penal philosophy is motivated by the rehabilitative philosophy, inmates are treated first as citizens with certain inalienable rights despite being in prison and not just as criminals who the society is better without. In some of those countries we find specialists like psychologists, social workers and medical doctors working as prison officers. The bottom line is that the role of the prison officers will change from being a guard or 'strict disciplinarian' to being a reformer and a change agent. The research on prison justice and prison reform shows that there are five major problems which afflict our system and which need immediate attention. 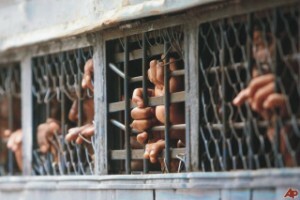 These are: overcrowding, delay in trial, neglect of health and hygiene, prison vices and management of open-air prisons. That our jails are overcrowded is a well-known fact. For example, if there are over 25,000 inmates in prisons though the prisons can accommodate only for 11,000. Overcrowding contributes to a greater risk of disease, higher noise levels, surveillance difficulties, which increase the danger level. This apart, life is more difficult for inmates and works more onerous for staff when prisoners are in over capacity. It is, therefore, to be taken care of. The release on bail of certain categories of remand prisoners, who constitute the bulk of prison population, will result in lessening the over capacity. Overcrowding may also be taken care of by taking recourse to alternatives to imprisonment. These being - fine, civil commitment and probation. There is yet another baneful effect of overcrowding. It does not permit segregation among convicts - those punished for serious offences and for minor. The result may be that hardened criminals spread their influence over others. On the other hand, juvenile offenders kept in jails get mixed up with others and they are likely to get spoiled further. So, problem of overcrowding is required to be tackled in right earnest for a better future. It is apparent that delay in trial finds under-trial prisoners in jail for a longer period while awaiting the decision of the case. The release of these prisoners on bail where the trial gets protracted would hopefully take care to a great extent the hardship caused in this regard. The mental agony, expense and strain which an under-trial prisoner has to undergo and which, coupled with undue delay, may result in impairing the capability or ability of the accused to defend himself. This problem has persuaded the many courts of the country in holding the right to speedy trial a manifestation of fair, just and reasonable procedure. Speedy trial would encompass within its sweep all the stages including investigation, inquiry, trial, appeal, revision and retrial. A perusal of the historical data shows the pathetic position in which most of the jails are placed insofar as hygienic conditions are concerned. Most of them also lack proper facilities for treatment of prisoners. The society has an obligation towards prisoners' health for two reasons. First, the prisoners do not enjoy the access to medical expertise that free citizens have. Their imprisonment places limitations on such access; no physician of choice, no second opinions and few if any specialists. Secondly, because of the conditions of their imprisonment, inmates are exposed to more health hazards than free citizens. Prisoners therefore, suffer from a double handicap. Talking about vices, there are many types of vices prevalent inside our prisons. It is an open secret. In many of them, a mix of inmate ingenuity, complicit visitors and corrupt staff has kept the level of inmate drug abuse constant over the past decades despite concerted efforts to reduce it. A recent boom in cell-phone smuggling has complicated matters; with inmates sometimes using phones to arrange drug deliveries and other major crimes. There must be a more rational way to deal with prison vices rather than awarding hard punishment to them. In the situation in which they are placed, a sympathetic approach is also required. Open-air prisons play an important role in the scheme of reformation of a prisoner. They represent one of the most successful applications of the principle of individualization of penalties with a view to social readjustment. It has been said so because release of offenders on probation, home leave to prisoners, introduction of wage system, release on parole, educational, moral and vocational training of prisoners are some of the features of the open-air prison (camp) system. In terms of finances, open institution is far less costly than a closed establishment and the scheme has further advantage that the Government is able to employ in work, for the benefit of the public at large, the jail population, which would have otherwise remained unproductive. The monetary returns are positive and once put into operation, the camps pay for itself. A fair prison system is a crying need of our time in the backdrop of great increase in the numbers of prisoners and that too of various types and from different strata of society. Efforts should be made to improve the system by introducing new techniques of management and by educating the prison staff with our constitutional obligations towards prisoners. And, it is in this context we should appreciate if government takes some initiatives and the Prisons Department will be subjected to radical reforms with immediate effect. The Department does not meet the present-day requirements. It will be heartening to note that if the concerned Minister understands the gravity of the problem and takes steps to engage in interventions to ease the situation. The writer is a Tourism Professional.